Those of you who've been reading my blog for a while should now be familiar with Ukrainian ambient black metal band Moloch. This release was put out in 2010 as a compilation by UK based label and distributor, Legion Blotan Records. It was originally released on a short run of 300 tapes, however I got sent a CDr version directly from Moloch. This release features 6 solely ambient tracks, all of which have featured on earlier releases. The opening track on II builds slowly with the sound of the wind, which is characteristic of Moloch's ambient work. Ambient strings puncture the wind and overpower it, along with a deeper, droning string section in the background, creating a slow and winding melody. This song is very relaxing and a world away from Moloch's ice cold, black metal persona. Second track, Kälte und Verwüstung.... has a more a sinister tome to it. Starting as it does, with louder strings and brass instruments. It's still got that droning effect thanks to the lower tones, but the melody played out is that bit more unnerving. I would liken this to classical music to a certain extent, as it's very regal and majestic in its delivery. This song very abruptly and leads into third track Im Schnee, which is the first time you get to hear Moloch's piano playing. Im Schnee almost upbeat at time this song, but it services as more of an interlude due to its length. The strings that heralded in this EP, make a second appearance in I. This song features a repetitive melody played on the same chords, which feature a varied pace, sometimes speeding up and sometime slowing down. There is not much else in the way of musical texture here, but it is meant to be a minimal ambient song, so that is not important. II is more of all encompassing song, thanks to brooding piano and the droning strings in the background. The wind again also features to give it more of a solemn feel. At this point I want to talk about the sound quality and production, which like the other Moloch releases I've featured here are impeccable. So its just left to the short piano piece in III to bring this compilation to an end and again, it's very uncomplicated and clean and emphasises the variation in instruments and sounds that Moloch weave into their ambient music. Definitely a strong bedfellow alongside the bands black metal releases. If you're intrigued and want to pick up a copy of this release, you can buy the tape version from Legion Blotan Records at http://www.legion-blotan.mutant-ape.co.uk/acatalog/Legion_Blotan_Releases. 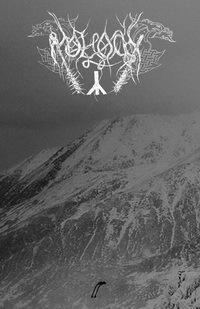 You can visit Moloch on Facebook at http://www.facebook.com/Molochukr and via their website at www.moloch.com.ua. Also stay tuned here, for three more Moloch reviews coming soon!